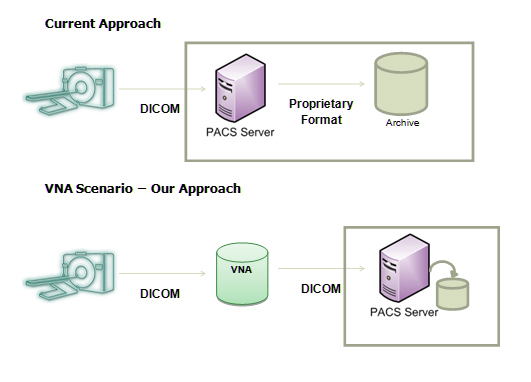 InstaPACS, a customizable WEB based PACS (Picture Archiving and Communication Systems) solution, is an archiving database server that stores high quality DICOM images and reports related to Radiology, Cardiology, Nuclear Medicine, Echo-Cardiology, Orthopedics, etc. It is a one-point source of information that is accessed by physicians over a local area network (LAN) and other specialists over the internet. InstaPACS is designed for single hospitals or medical centers. With InstaPACS, you are relieved of the costs of procuring and storing film archives. Film archives can get damaged or misplaced and retrieval can be time consuming. InstaPACS overcomes these challenges and increases the productivity of your hospital. InstaPACS saves time for patients, doctors, specialists, and the hospital staff. Referring specialists can view DICOM images within seconds as streaming technology is progressive and prioritizes the streaming of clinically important data (images on demand). Irrespective of the bandwidth of the internet connection, the viewer downloads and displays the refined image almost immediately. As medical specialists can access DICOM images remotely and send back the diagnosis within minutes, general physicians start treating patients at once without wasting time waiting for a specialist to arrive at the hospital. Hospitals and medical centers can share information in real time for teleradiology practices. The viewer includes readymade report templates and patient history for quick reporting. Macro support in reports makes textual entry faster. InstaPACS brings down costs of IT and administrative tasks by managing workflow efficiently. By archiving medical images in the database, physical film archives need not be maintained. Non-DICOM images can be converted via a DICOM converter. A workflow manager manages the workflow efficiently. Quick access to medical images leads to faster diagnosis, quicker report turnaround times, and high patient turnover. You can increase the hospital’s outpatient capacity, increase productivity of physicians and specialists, and optimize utilization of hospital resources. Enterprise InstaRad is compatible with Windows®. The release of Linux™ and Mac version is under progress. InstaPACS can be deployed on the RDBMS of the customer’s choice. InstaPACS works on various servers — Dell™, HP®, IBM®, Sun Microsystems®, etc. You can install the product on existing servers of specified configuration. InstaPACS can be integrated seamlessly with existing HIS (Hospital Information Systems), RIS (Radiology Information Systems) and EMR (Electronic Medical Records) system. InstaPACS has a fault tolerant architecture to ensure services are not disrupted. The model of the solution is scalable and images and information of any number of cases can be stored. More users can be accommodated by adding hardware. InstaPACS uses database backup scripts for regular data backups and complete database backups ensuring data is always protected. InstaPACS supports two-level reporting workflow. A report is prepared by a junior doctor and reviewed by a senior specialist before sending it back to the remote centers. Doctors and specialists can collaborate in real time for better diagnosis.